It's hard enough to make original pictures, but with some subjects it simply borders the impossible. When visiting Victoria Falls I almost decided to not even bring my camera, until locals told me that an elephant had been seen in the area. I decided to stay a few days longer and hope for the best. On the third day the elephant walked right up to the edge of the falls and I shot the most original image of this iconic location. 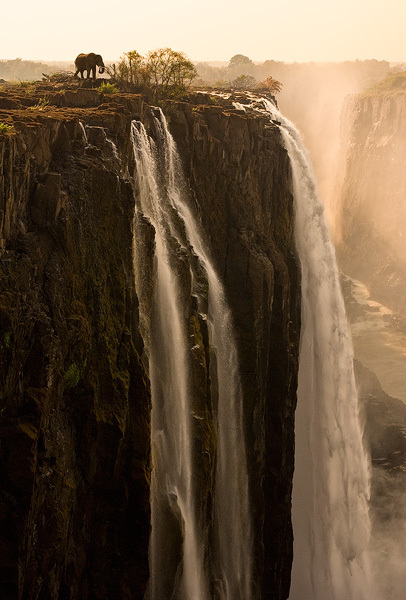 The horizontal version of this image was featured as a double page spread in National Geographic Magazine, and won First Prize in the European Wildlife Photographer of the Year Awards.